Scholastic has unveiled new covers for J.K. Rowling's Harry Potter series. The covers are illustrated by Caldecott Medal-winning artist Brian Selznick. 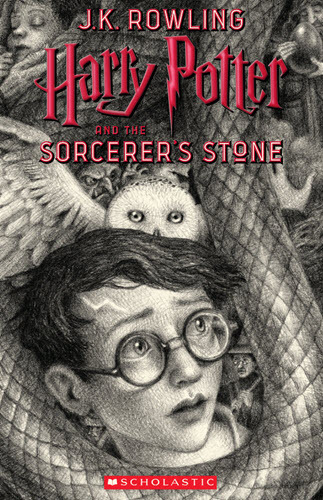 They will be published in the U.S. on June 26, 2018 to celebrate the 20th anniversary of the U.S. publication of Harry Potter and the Sorcerer's Stone. Selznick is best known for this hand-drawn illustrations in The Invention of Hugo Cabret. The Harry Potter covers depict exciting moments from the series. The black-and-white images feature a jewel-toned type. The new covers also form a single image that tells the overarching story that begins with Harry Potter's arrival at Number Four, Privet Drive, through the conclusion of the Battle of Hogwarts. Selznick says in a statement, "I'm a huge Harry Potter fan (a proud Hufflepuff!) and to be asked to illustrate the 20th anniversary edition covers was an absolute honor. I knew this project came with so much responsibility to the stories, as well as to the readers. I revisited the books and was especially moved by the relationships between the characters in J.K. Rowling’s magical world, so I wanted these covers to reflect that. One of the most challenging and rewarding aspects of the process was drawing seven independent covers that would stand on their own, while making sure that they also lined up to create one single satisfying image. It took dozens and dozens of sketches to get it right, and I am thrilled to share my great love for the books with these new illustrations." These images show the single combined image in two parts. Selznick did an amazing job.